The Madden Bowl is the biggest digital sporting event of the year, which is fitting since it takes place alongside the biggest real life sporting event of the year. Even if you're not into the Giants or the Pats, chances are you're into Madden football if you're any kind of NFL fan. Apparently a lot of players like it too as the EA Madden Bowl will be featuring a lot of big time talent that won't be playing in the big game. 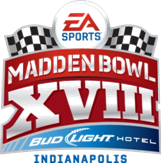 Madden Bowl XVIII is the quintessential players’ tournament that showcases NFL superstars and their gaming skills on the virtual gridiron as they face off on Madden NFL 12. NFL stars attending Madden Bowl XVIII include (subject to change): Drew Brees (QB, New Orleans Saints), Larry Fitzgerald (WR, Arizona Cardinals), Matt Forte (RB, Chicago Bears), Arian Foster (RB, Houston Texans), Antonio Gates (TE, San Diego Chargers), Jimmy Graham (TE, New Orleans Saints), DeSean Jackson (WR, Philadelphia Eagles), Von Miller (LB, Denver Broncos), Tim Tebow (QB, Denver Broncos), DeMarcus Ware (LB, Dallas Cowboys) and Patrick Willis (LB, San Francisco 49ers) among others. If you'd like to get in on the festivities and do a little 'game with fame', just send a friend request on over to 'NFLBaller2012' and start up a game of Madden '12 around 5:30pm EST on February 2nd (tomorrow)- oh, and don't forget your headset, because if you get an invite you'd best be ready for some football.